The Dining table and chairs came from an old library, they are solid oak. of the table and 8 chairs for under $200. Everything is done very simple, and easy this year. 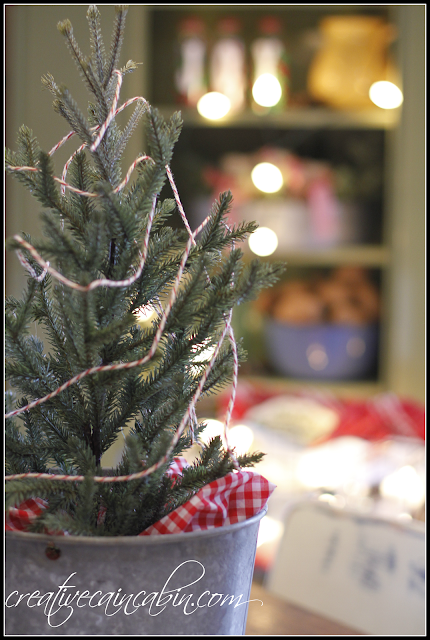 A small tree in a galvanized bucket sits in the center of the table. To give it a little color I used some gingham fabric around the bottom of the tree and some multi colored twin around the trees branches. 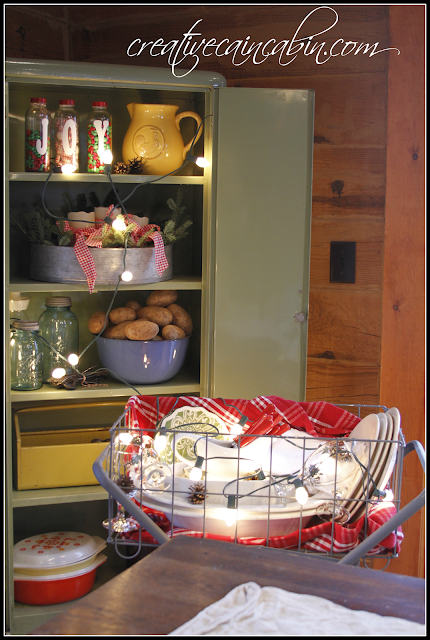 I loaded our vintage laundry hamper with Christmas dishes, flatware, and a string of lights. 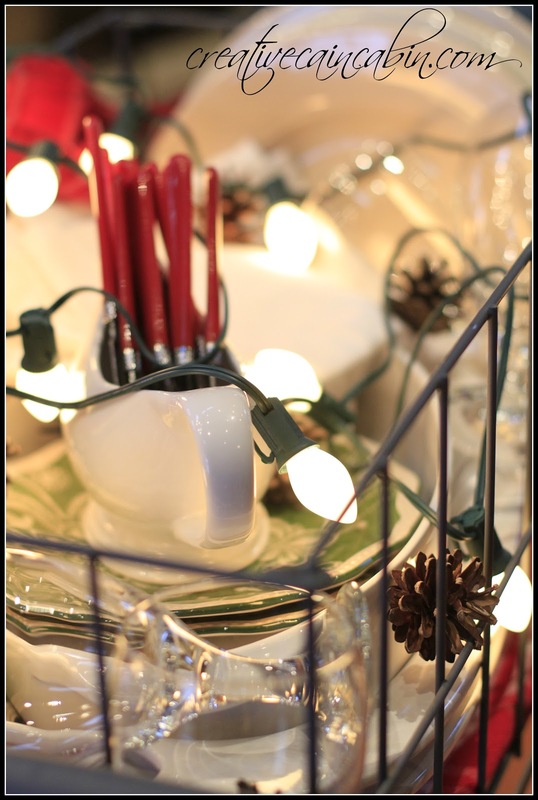 I just love the look of the lights amongst the dishes. 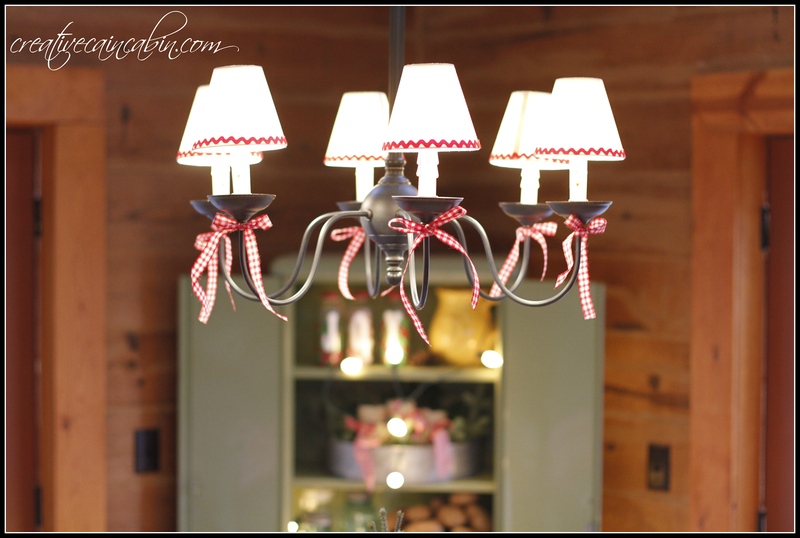 To dress up the chandy I added paper shaded and hot glued red rick rack around the edge. I also used recycled ribbon bows for just a little extra color. A simple grain sack runner was added to the table. And that vintage green beauty in the background is my new found treasure. It is some sort of a metal locker, and I love it. It fits perfect in that space, and I can decorate it according to the seasons. 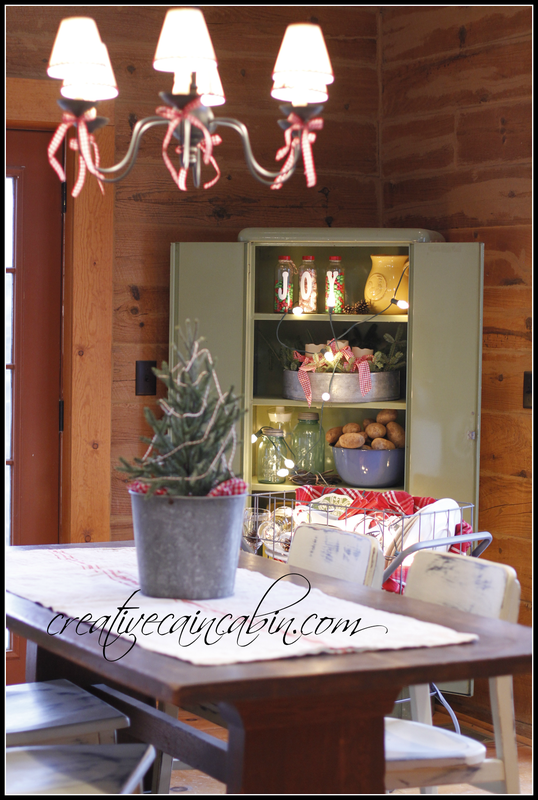 Right now it holds a few Christmas thing and a few kitchen things. I am very happy with the simplicity of it all. I haven’t felt the stress of Christmas at all this season. 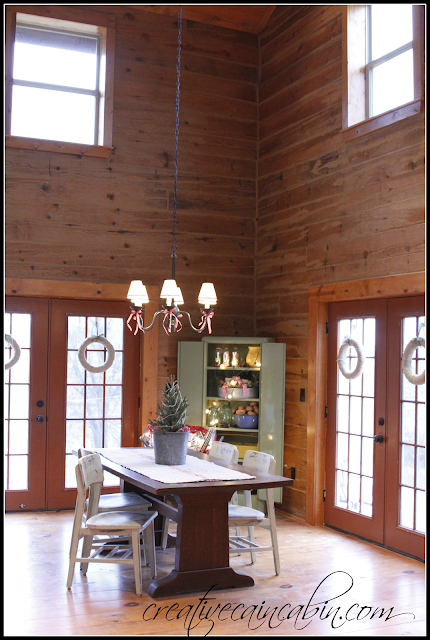 Here’s a view showing you how high our ceilings are, and the wreaths on the french doors are straw wrapped in burlap. Just beautiful, Dawn. I love your new metal cabinet. Can’t believe you got the table and chairs for under $200! Great story. Oh it’s just beautiful; and those ceilings! The library table and chairs are perfect for the space! Cute, cute, cute. So funny you and I have used some of the same ideas or things. 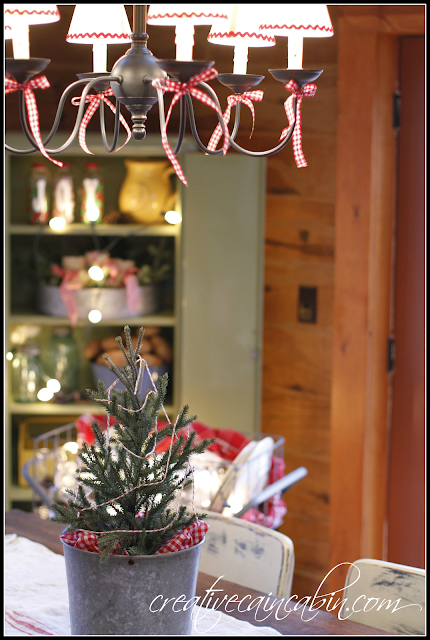 I haven’t shown the sun room yet, but I have the tree in the olive bucket and I have used the red handled dinnerware in my breakfast room. Great minds think alike! Soooooo pretty Dawn!! 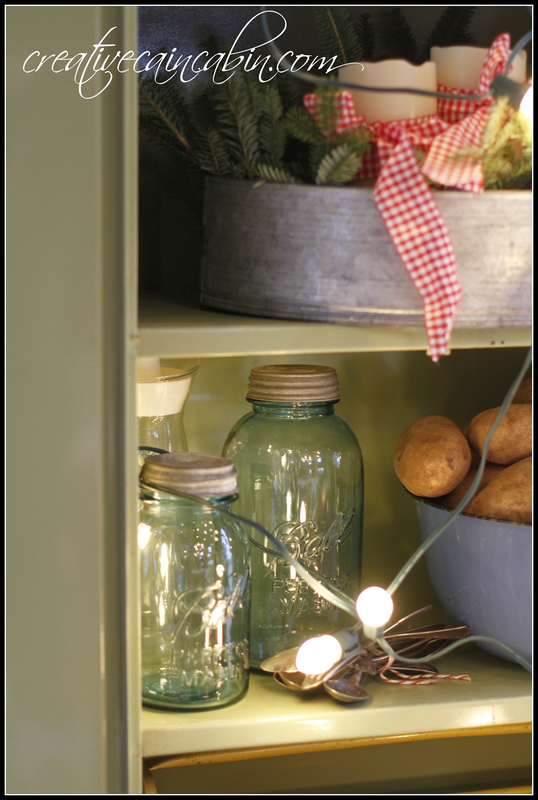 I love how you added the set of lights to your cabinet! Your dining room is amazing, Dawn! Love your new cabinet and how you decked it out for Christmas and I have always thought that red and white gingham is perfect for Christmas!! O’ Dawn, I’d love to be there kickn’ back with ya and having a cup of hot chocolate. Your cabin home is so cozy comfy! I’m a big fan of simple,easy living!! It’s always fun to stop in and see what you have done. Thanks for sharing your Christmas creativity! 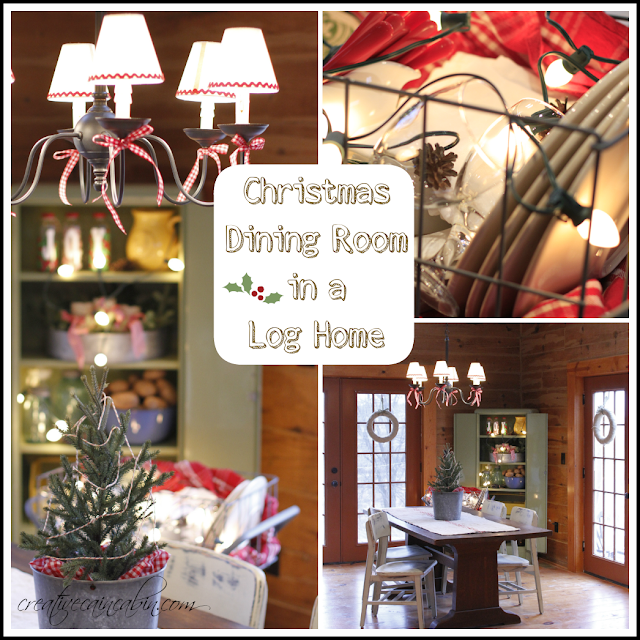 Your dining room looks so pretty,and festive.I love your little cute tree on the table. 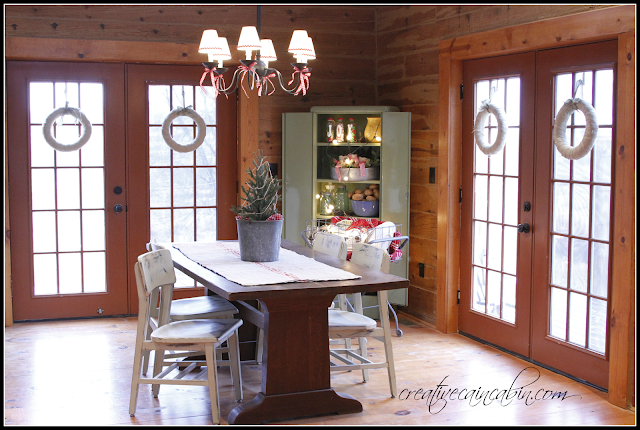 Dawn, Your dining room is beautiful! 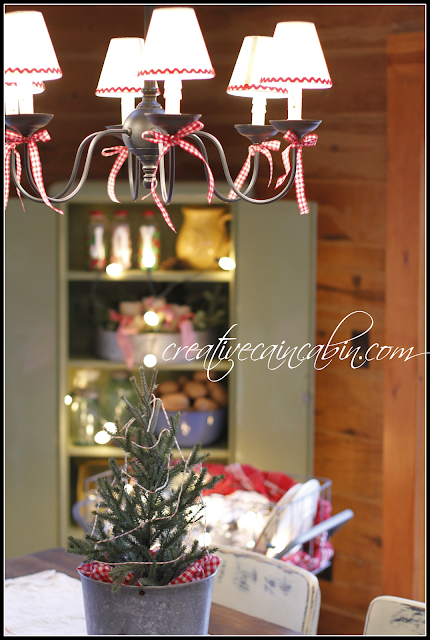 I love your style, your home is definitely magazine worthy, Country Living ought to pay attention. Love the simplicity! What a wonderful centerpiece! Thank you for sharing this at Rustic Restorations Weekend! Your dining room is perfect, Dawn! I’m totally envious of that wonderful table — you got a fantastic deal! The green locker is decorative and looks to be super-useful. 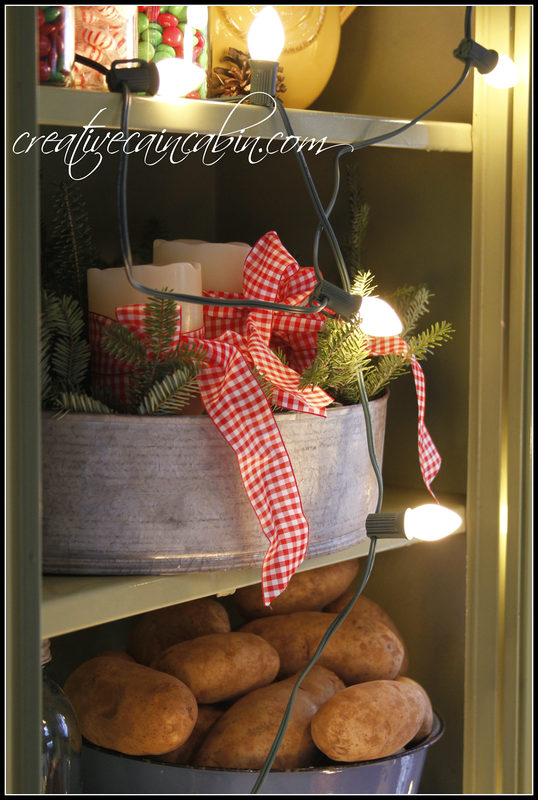 I love the old laundry basket filled with dishes and the lights are just icing on the cake! I love your high ceilings, but do you have trouble keeping your home warm with those high ceilings? Just curious!